Oxalic acid (H2C2O4) is a relatively strong organic acid and is a common reducing agent in organic chemistry. There are a number of methods for preparing oxalic acid from nitric acid, and one important difference among them is the amount of oxalic acid that is produced from a given amount of nitric acid. 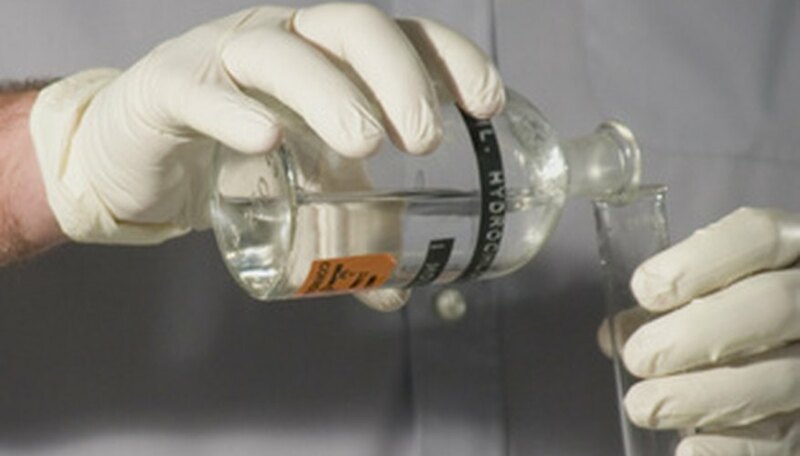 Oxalic acid can be prepared in a laboratory with nothing more than sugar and nitric acid, although a small amount of vanadium pentoxide will act as a catalyst and allow the reaction to proceed much more swiftly. Place the sugar in the flat-bottomed flask and add the nitric acid. Heat the flask in a bath of boiling water. The sugar will dissolve in a vigorous reaction that produces an extremely large amount of nitric acid fumes. Remove the flask from the water bath as soon as the reaction begins to produce the fumes, and place it on a surface that will not conduct heat. After the reaction subsides in about 15 minutes, pour the still-hot solution into an evaporating basin. Evaporate the solution with mild heat from a Bunsen burner for about 15 minutes until it reaches a volume of about 20 mL, then add about 40 mL of water. Evaporate the solution down to about 20 mL again, and thoroughly cool the solution in an ice-water bath. Allow the rapidly forming crystals of oxalic acid to complete their crystallization in about 10 minutes. Filter the remaining solution through filter paper, and add the crystals to a small amount of hot water. Allow the oxalic acid to recrystallize, which should take about 20 minutes. Dry the crystals by pressing them between pads of drying paper or with a desiccator. Don't use an ordinary oven since this could cause the oxalic acid to decrystallize. This preparation should yield about 7 g of oxalic acid. This method will produce a large amount of nitric acid fumes and must be performed under a fume hood with adequate ventilation. Robinson, Allan. "How to Make Oxalic Acid." Sciencing, https://sciencing.com/make-oxalic-acid-5328735.html. 24 April 2017.